This Carson City resident was intent on getting away from the grind and finding a hot spring to soak in. She found it in Tecopa. 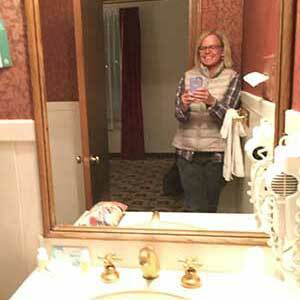 Introducing the first in a series on Finding It in Nevada. Though I am a hot springs enthusiast, I had never even heard of Tecopa Hot Spring before I spotted it on a map in September. 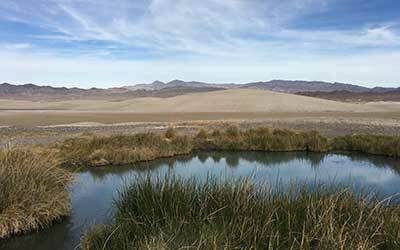 A trip to Tecopa for me was a two-day drive coming and going. I took Highway 50 east from my place in Carson City and then Highway 95 south to Tonopah, where I spent the first night at the historic Mizpah Hotel: antique fixtures, claw foot bathtubs, high quality bedding and coffee served on each floor early each morning. 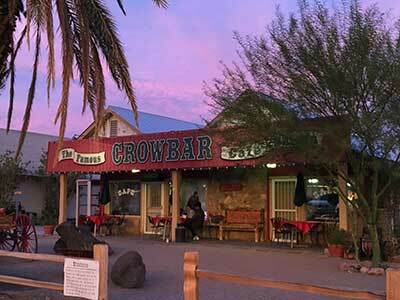 The restaurant in the hotel, the Pitmann Cafe, is said to be one of the best in rural Nevada. 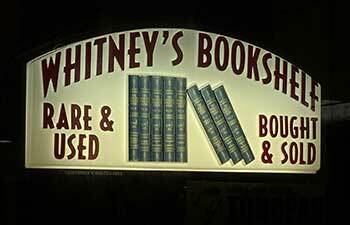 Also on Main Street is Whitney’s Bookshelf, a favorite used bookstore. I rarely find a title I’m looking for, but I always find a book I want to buy. Larry Whitney, the store’s owner, is full of insight and a very interesting person to talk to. This visit I picked up Laughing Boy by Oliver LaFarge and Last Go ‘Round by Ken Kesey. With a few exceptions hard covers are $2.50 and paperbacks are $1. The Tonopah Brewing Company, a couple of blocks uphill from the hotel, serves a variety of beers brewed on site, and BBQ. I liked the Mucker Irish Red Ale. Tonopah has always had a weird vibe to me. It’s an old mining town that has known booms and busts and it shows in the contrast between the old run-down houses and storefronts and the grand Mizpah Hotel and some of the new and thriving businesses. I always have the feeling that the next time I’m through I might find half the town boarded up again. But, at least for now, Tonopah seems to be thriving. This drive to Tecopa is full of childhood memories, interesting history, stunning views and solitude which I adore. Growing up, my folks would take us on winter camping trips to Death Valley for a break in the wintry weather and to see the wildflowers blossom in February. It took me all day to drive down to Tecopa by way of Pahrump with many photo stops and an easy driving pace. 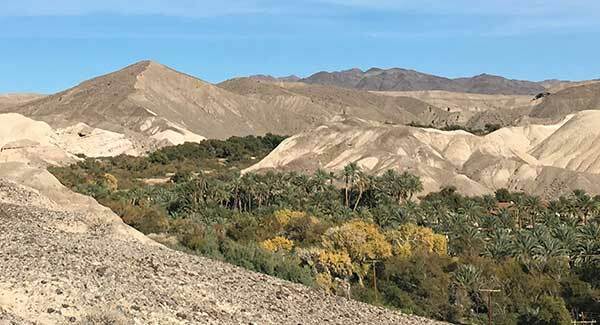 Tecopa Hot Springs is made up of three small camping resorts, Tecopa Hot Springs Campground and Pools, Tecopa Hot Springs Resort and Delight’s Hot Spring Resort. The Tecopa Hot Springs Resort offers RV and tent camping, a few cabins and a small motel with private mineral pools for the rooms. I stayed here the first night. I enjoyed the private tub and the room was clean but not fancy. The Tecopa Hot Springs Campground pools are wonderful, very clean with a low key, relaxing atmosphere. The men’s and women’s pools are separate and bathing suits are not allowed. 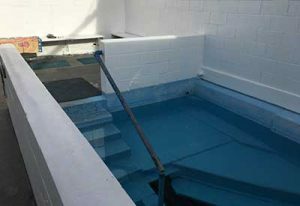 The women’s area has two large tubs or small pools. The first tub is open to the air and the second has a roof. There are showers, toilets and benches throughout the small bathing area. seemed to be the nicest of the three RV parks because it’s off the main road and has wonderful views on the desert to the east. I only went by it on my runs and didn’t investigate it. I used these pools in the morning and evening each day. It was so calming and deeply relaxing. Other users keep their conversations quiet and everyone spends a lot of time in silence. I learned that many of the visitors who come regularly are retired Japanese folks from the Los Angeles and Las Vegas areas. It makes sense given the popularity of hot springs in Japan. I woke up early, made some coffee on the picnic table outside my room and sat for an hour watching the morning light change on the colorful desert. In the afternoon I drove the seven miles to the town of Shoshone. I needed an extra jug of water and I needed to get on the internet if I could find a connection. There is no cell phone coverage in the Tecopa area at all. In Shoshone I found a small grocery store with high prices and a lot of tourist stuff related to Death Valley. I was pleasantly surprised to find the Shoshone Museum across the Highway from the market. It has a bit of everything, settlement and mining history, native American culture as well as some paleontology with a dinosaur bone display. The woman working at the museum asked my if I would watch the desk for her while she ran to the post office and I gladly obliged. There is a Wi-Fi hotspot at the museum, so while I was in charge I sat on the bench out in front and checked my work email. I started the day again with a run, to a good sized marshy hot pool called The Dip where at 8:00 am there were already happy folks soaking. 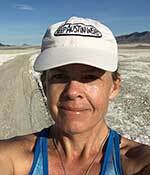 I went on up the trail to an area called the Mud Hills, a gorgeous five-mile round trip run followed by another soak at Tecopa Hot Spring. 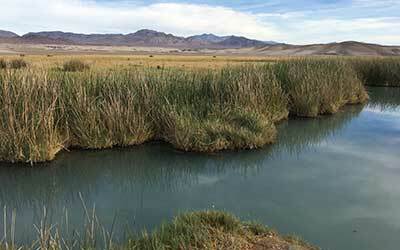 China Ranch is about nine miles from the Tecopa hot spring resort area. Take Old Spanish Trail a couple of miles and turn right on China Ranch Road which becomes narrow and steep and feels very remote, which it is. The most common vehicle traffic is the off-roaders. The landscape is barren. The canyon is made of dramatically eroding, sparsely vegetated buttes and hills of white, cream, orange and brown. It’s reminiscent of Death Valley and the views around Zabriskie Point. 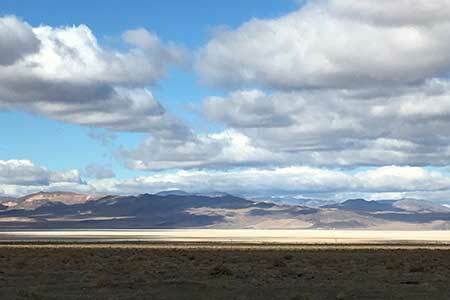 China Ranch Date Farm is a family-owned working date farm located on the Amargosa River. The river is famous for running mostly underground, but the narrow valley through which it flows here is green, in lush contrast to the surrounding barren desert. I hiked to the top of a ridge where I was able to get views of the farm and much of the canyon. 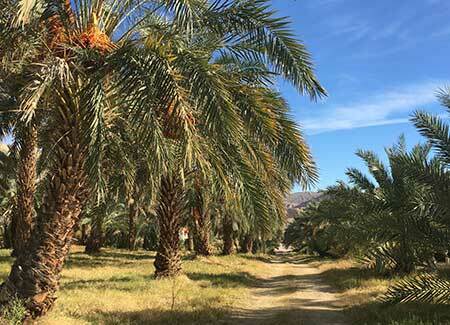 It was stunning: a lush date farm tucked out of sight in the middle of the harsh, mountainous desert. The orchards are planted in sections according to the date varietal and country of origin. The bakery serves date milkshakes, breads, cookies and muffins and sells dates grown on the farm. I sat in the shade outside and ate some date bread — which was delicious. The folks enjoying milkshakes looked very happy too. 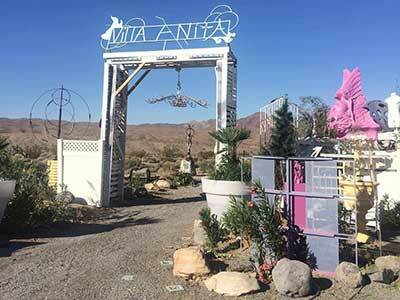 From the farm I drove back toward Tecopa to the Villa Anita, an ever-evolving art installation created by David Aaron Smith and Carlo Roncancio. It is a sprawling two-acre labyrinth of rooms, gardens, sculpture, works in progress. I spent a fascinating hour with artist David Aaron Smith. All the rooms in the “villa” are covered with his original art, paintings and sculpture, vintage and modern one of a kind furniture, found art, plants, flowers and trees and the fashion photography of Carlo Roncancio. He explained that he uses plastic and glass recyclables to insulate the floors and walls and that the temperatures inside during the summer are pleasant when outside it can be 120 degrees. You can visit Villa Anita for the tour and the tea, or you can stay there and experience the art in total immersion; it operates as an Air B-and-B as well. And if you are an artist or find yourself drawn even further into the work, you can volunteer and arrange to stay for a time to help add to the vision. 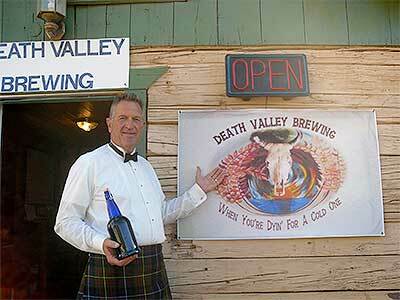 I stopped in Tecopa at Death Valley Brewing. One of the owners was working the bar and served me an IPA. It was cold and good, and the atmosphere was casual and friendly. It was my final evening at the hot spring and there was live music at the outdoor stage. I was curious so I headed there. It turned out to be the Executive director of the Hot Spring Conservancy who I’d met when I arrived, on drums, the gal who works in the camp store and gift shop singing and playing guitar and her husband also singing and playing. About 50 people gathered for the music, all sitting on hay bales or at picnic tables drinking their own beer and wine. They were locals and people from the campground. It was a very pleasant evening. Another repeat of my run and soak morning routine, followed by packing up to head back north toward home. I pulled out of Tecopa on Highway 127 toward Death Valley Junction. 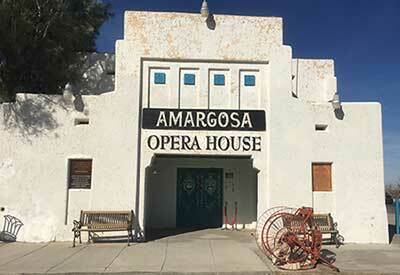 My Dad had taken my sister and me to the Amargosa Opera House when were maybe nine and ten years old. My sister was interested in ballet at the time and an eccentric artist and dancer named Marta Becket had been living in Death Valley Junction and performing ballet in the old opera house. 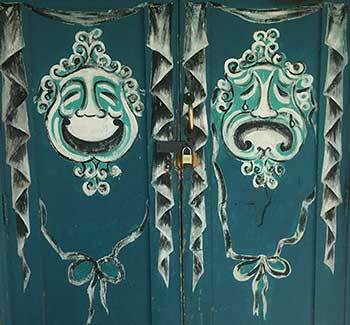 She had also painted murals of audiences for the shows on the inside walls. It was odd and a little spooky and the memory of has never left us. Driving north on Highway 95 it was wind with puffy white clouds and bright sunshine. The White Mountains to the west were dramatic with snow covering their peaks against the crisp blue sky. I made several stops to take photos and just watch as the clouds ran by. My destination was again Tonopah, where I spent my final night in luxury. I continued north on Highway 95 back to Yerington but took Highway 208 through Smith and along the East Walker River to meet up with Highway 395 at Holbrook Junction. The river canyon gets very narrow and steep outside of Smith. 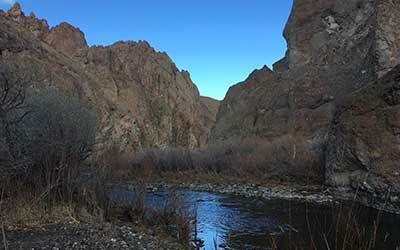 It has tall rocky walls jutting straight up out of the water and the banks are covered with willows and cottonwoods. It’s a beautiful place to stop, stretch and poke around or have a picnic lunch. I drove back into Carson Valley at dusk. It was cold, and the air was clear. Jobs Peak, Jobs Sister and Freel stood watch as always over the ranches and communities of Minden, Genoa and Gardnerville, their peaks dusted with snow. As I often do ending an adventure on the open road, I felt a melancholy yearning to keep going . . . maybe never stop. Evangeline Elston grew up in Silver City, directs the Valhalla Art, Music & Theatre Festival at Lake Tahoe and spends free time rediscovering Nevada. Yes, we are aware that maps show Tecopa across the line in California. But have you ever seen that line? No. No-one has. It’s not real. Tecopa, Shoshone and environs are firmly within Far Western Nevada which extends all the way to the ridge line of the Sierra and includes all of Owens Valley among many other interesting and enjoyable places. Far Eastern Nevada includes the Grand Canyon. Far Northern Nevada: Boise. If you have a personal Nevada Adventure to share, please reply to this email with a brief description + video/sample pix.